This last day of May was a fine day to get out of the Gunnison basin and travel over Monarch Pass and down to the small City of Salida and environs. About five miles west of Salida lies the town of Poncha Springs, the self proclaimed Crossroads of the Rockies better known, perhaps, as the junction between U.S. 50 and 285. South of this town about six or seven miles on U.S. 285 is a small, inconspicuous trailhead where the Rainbow Trail crosses this major north-south highway. The Rainbow Trail starts further to the west and also runs on the north and east side of the Sangre de Cristo Mountains all the way down into northern Huerfano County. It is a long trail and would take over a week to hike the entire distance. Today, I was going to walk along the first three miles or so east of U.S. 285, up towards Poncha Mountain. Motorized vehicles are allowed on this trail, but on this day I didn’t see anybody but other hikers. This relatively low country is now free of snow but the highlands surrounding the area are still covered in a thick layer of it. After I climb the first mile or so, there is an overlook that allows me to see Mounts Antora and Ouray as well as most of the southern portion of the Sawatch Range. From this vantage and those nearby the eastern face of Mount Ouray has been carved by a large glacier and the result is a topographic landmark aptly named The Devil’s Armchair. I’m sure you can imagine it in your mind’ eye, only make the construction large and made of rock. The colors today are beautiful, a bright, clear day that I always enjoy. Everything is wonderful. The aspen in the lower gulches have their leaves out and the flowers are beginning to bloom as well. Draco and Leah are with me today, and it is strange that I have to worry about the lack of water rather than the abundance of it. After a wet, rainy May, this last day of the same month is warm and delightful and it is no wonder that the trailhead is so busy. So glorious! I eventually climb into the sub-alpine forest where a few, small desultory patches of dirty snow linger. Mostly, though, the ground is open to the sun. I find a high point, a small ridge, really. There is even a small cornice of snow hanging on the northern rim, a reminder of the past Winter and also, in its diminutive size, a harbinger of the coming Summer. I sit near the edge and gaze up the valley of the Arkansas as it makes its broad turn north, mountains rising from the banks sometimes directly, sometimes after rising first in a broad plain. I am happy for this day, being here at the northern tip of the Sangre de Cristo Range. A mighty chain of mountains that runs all the way south to Santa Fe, New Mexico, this northern half is especially narrow and has one long ridge running like a knife’s edge on the eastern edge of the San Luis Valley. The weather is so fine! I had left early enough in the morning that the potentially hot climb on a southern exposure could have been hot and uncomfortable but was instead made in the cool, comfortable atmosphere of the morning’s salubrious clime. Besides the aspen mentioned earlier, I am pleased with hiking among my old, dear friends, the ponderosa, pinyon and bristlecone pines. There are some cactus in bloom on the low, warm slopes but higher up the aspen have yet to leaf out. So similar to the Western Slope, the eastern slope of the Great Divide is drier and the height of the grasses reflects that. We rest, or rather, I do as the dogs scamper about, investigating the likely location of suspicious rodents who are loudly chirping out their warnings. I decide to walk a bit further on, perhaps an additional half a mile as the Rainbow Trail begins its decent into and eventually crosses Sand Gulch. I am enjoying myself here, but it is now hot and bright and the dogs could do it but I don’t want to go any further without knowing where the water sources are. And I am tired enough and my desire to trek about has been sated. We turn around and climb back up towards the sub-alpine forest where a refreshing patch of snow awaits the hot and thirsty canines. They roll and fling themselves about in a wild fit of canine abandon. Lying on the snow, letting their heat flow away, they simultaneously munch mouthfuls of snow before we walk back down towards the trailhead. The sun is now beating down but the easy pace combines with enough shade to make the trek enjoyable and as I see hot, sweaty people hiking upwards I am especially content with my effort to rise early and beat the heat. We return to the car and soon are speeding down the pavement fifteen to twenty times the velocity that I had when walking. This modern conveyance takes me easily to many diverse locations, but for that same modern world and its never met satiation for speed I would probably be walking that much more. It is now late May and the snow line is receding further up the mountain side. Day by day the snow melts and flows downhill towards the Pacific Ocean so many miles away. The colors are vibrant: fluffy, white clouds, green grass, willow bark a bright yellow and the sky a deep cerulean. Put together it is a visual pageant, a feast for the eyes. Along with the visual stimuli are the audible sounds of running water tumbling over the larger rocks as it flows down on its gravity driven path. Thus, I found myself a scant five or six miles west of the Great Divide on this mostly sunny day. Driving up from my home in Gunnison, Colorado, I drove the car up beyond Pitkin and onto the Gunnison National Forest. I took Road 767 and parked just beyond the junction with Road 769. In this large meadow on Middle Quartz Creek I began to hike following the latter road. Almost immediately I stopped to take off my shoes and wade across the flowing water. It was crystal clear, not terribly deep and flowing along at a good clip. This is motorized access that I was hiking along but in this early season the roads were still unpassable and all ended at huge snow banks in the high country. Thus, I saw no other people as I walked uphill through the thick lodgepole pine forest. There was, however, plenty of water flowing from the porous rock. Numerous springs or freshets were spilling the clear liquid across the rock. The rock shone in the sun, a granitic type replete with large crystals of dark feldspar and light quartz, hued slightly to the red spectrum and therefore creating a pinkish tint. The hill I was climbing is the spur of land between Middle and South Quartz Creeks. After a half a mile of trekking along, I came upon a rough(er) road that leads up the drainage of the southern fork of Quartz Creek. Quartz Creek could be considered the northern fork of Tomichi Creek, itself being an eastern fork of the Gunnison River. 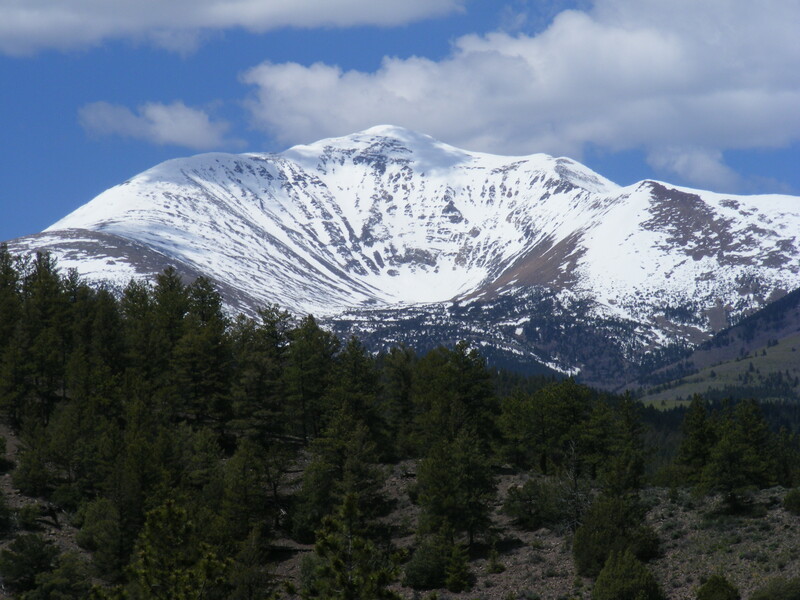 The high ridges that these drainages end at are part of the mighty Sawatch Range that runs from Salida to Leadville and divides the continent into the Atlantic and the Pacific. This road was inundated by a steady stream that had overflowed the main channel upstream somewhere. Naturally, I wasn’t about to let a small bit of water impede my escape from the video screen and into the warm, sunny glory that is the Colorado Rockies during late May. I mean, of course, if it isn’t raining at the moment although even then the sun may be shining through a gap in the precipitous clouds. This particular May was especially wet and even now, with a mostly sunny sky that allowed the sun to pour down the brilliant, clear light the mountains are known for, it could rain if the clouds build up as they do occasionally in the high climes, suddenly, with little warning and a terrible force full of thunderous lightening. I am in rapture, hiking through my beloved high country, a narrow canyon, a steep V, that is nary thirty feet in breadth at the naturally carved gates placed here at the entry to the passage through rock. The creek is choked with a tangle of lush, heavy green brush, the gray, more-or-less horizontal boles of deceased lodgepole and rounded granitic boulders of varies sizes. The grade of the flowing water is steep enough to not produce waterfalls but rather a series of chutes and small plunges and cascades occasionally interrupted by still pools created by the debris just noted blocking the flow albeit temporarily. The creek bottom widens out slightly as I continue to climb upstream. I pass Bonnie Creek, one of those topographic oddities that flows east towards the Great Divide although most of the larger drainages on this western side flow that direction towards the Pacific Ocean. The creek would probably have been formed from some fault in the rock, or who knows what. As I stroll along, Draco and Leah skittering along the trail in a never-ending infatuation with the small, furry things that live here, I come across the point where the water has jumped the banks of the main channel begins its deluge down the road I’m walking. I continue on for about a hundred feet or so before the road is again soaked, but this time it is by the flow of water emanating from the hillside above. The road is wet again, but I stroll on. The water is mostly from melting snow above, and, the rocky hills having no real abilitity to soak up water, it flows along the surface and when it does seep down through the cracks in the igneous rock or into an older sedimentary layer it will soon be expelled from the rock through other cracks in the rock, appearing to us as springs. The geology changes quite suddenly. The road begins a steeper climb up a small dam of rock, and here are beaver dams on the crest of what may be a terminal moraine. Now the land and the road levels out a bit and the water here is pooled up behind the beaver dams and the valley widens to the point where there are enough grassy breaks in the forest so that I can observed the high peaks yet encrusted by cornices and fields of snow. The V shaped valley has also changed into the U shape that is a broadly accepted indicator of past glaciation. Finding a dry southern exposure that has a view has gone from a great difficulty to a simple ease. There is a cabin just down the road that I had walked by and I have a certain envy of the folks who have been blessed enough to have spent a night in this relatively small drainage. There are some early season flowers in the grass, and the new green is bright and colorful. It is fortunate for me that there exists this easy place to relax as the road has now become choked with late season snow at the eleven thousand foot level. It is high country splendor as I sit and enjoy the warmth of the sun and the breeze is cool and fresh. The willow have yet to leaf out but the bark is a bright yellow and the entire scene is almost too pretty to believe except that I have seen it with my own eyes and felt it with my entire being. I can hear the water’s tumultuous passage as well as touch the sparkling current. Glory! Oh! What fine fortune has brought me to this place and it is with a soft sigh that I get up to retreat my steps back down South Quartz Creek and wade again through the middle fork before returning to my car. Rising up on the far bank I spy a huge, dark brown mass in the willow and realize that we are sharing space with a moose that is heads down browsing the willow. A rack denotes the presence of the bull and he is far enough away to continue browsing although aware of or suspecting our presence. He continues to munch away and slowly moseys about as we hike back to the car happy to have been graced on this last bit of hiking. A fine hike, short in length but vibrant. Sometimes I like to get out and walk along a path that isn’t all that challenging in a physical sense. On the north bank of the Taylor River, just upstream from Spring Creek, such a trail starts at the appropriately named North Bank Campground. 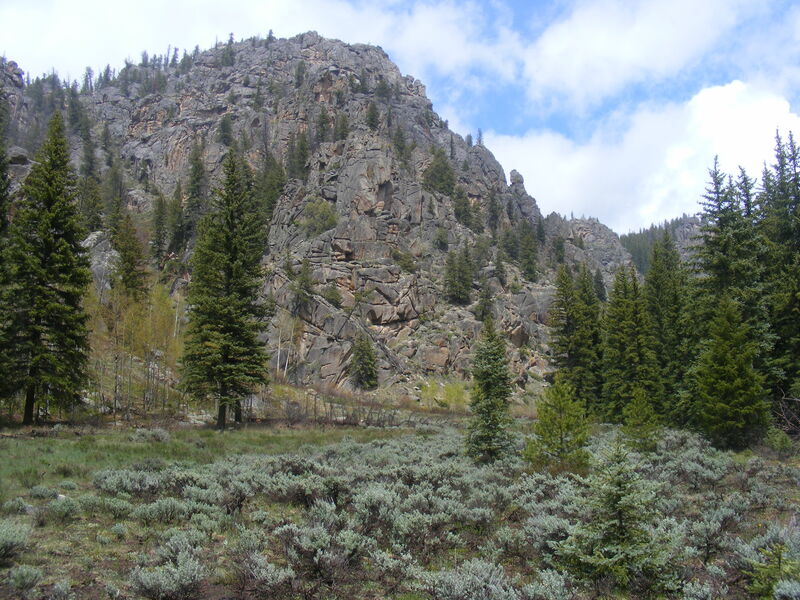 This type of trail is often referred to as a User Created Trail and is not maintained by the Gunnison National Forest on whose property is lies. Because this trail is not marked on maps the only way to know about it is through exploration and local word of mouth. What I appreciate about this trail is that is rolls along the bank of the Taylor River in its deep canyon that has been cut through the bedrock of the Rocky Mountains. There isn’t much elevation gain and the physical exertion needed to walk along here is relatively minimal. This isn’t wilderness by any stretch of the imagination, as the Taylor Canyon Road parallels the river on the south bank, but the noise from the light traffic is often obscured or obliterated by the sound of the rushing waters tumbling over rocks. This is another area where I am apt to find one of my favorite tree species, ponderosa pine. Most of this hike is tucked up against the steep walls of the canyon but there are a few places where the river bottom widens out a bit and the resultant parks are interspersed with conifers and sagebrush and wildflower species that have, collectively, all the colors of a rainbow. The fragrant smells invigorate my senses, allowing for a certain clearing of the mind whenever I hike in the mountains. Rafters floating by, sometimes with fly-fishers sometimes not, passing traffic whizzing by and campers at the Rose Lane Campground rarely take notice of the shepherds and myself as we walk quietly by. The rocks allow for some scrambling if that is what I desire to do and occasionally I will climb up for a better look around. Today is somewhat special because it is the the first time that I have noticed the new leaves on the aspen. They are colored that peculiar lime green that indicates new growth on Populus tremuloides, one of the most abundant species of tree in the northern hemisphere. Aspen are part of the Willow Family, known also as Salicaceae, and can grow in large colonies of clones. Regardless, the coming of the leaves is always a sure sign that Summer is near if not actually here quite yet. May has continued to be wet and today is no different, although the clouds are spaced apart enough to allow for occasional blue sky and shining sun and the temperatures are moderate. I enjoy our quick stroll immensely and I believe that the German shepherds feel the same as they set their noses to the ground and sniff about for rodents and other fascinating smells that are lost to me and my poor olfactory ability. After a couple of miles we turn around and return downstream to the waiting automobile. My soul has been refreshed much as a plant is refreshed by a downpour of rain. I thrive on the scented forest but I am also especially stricken by the eroded pink granite full of light and dark crystals that denote the different composition of minerals that make up our Earth. There is much to do at my home in Gunnison and although sometimes I am reluctant to head home after such an outing, today I head back feeling that a burden has been lifted and am grateful for the abundance of life and diversity of species that The Creator has strewn about. After a relatively mild Winter and early Spring, May came roaring in with one storm system after another. The Gunnison River basin snowpack actually increased during the month in total depth and relative depth, increasing from below one hundred percent to well above that, almost double. Writing this in retrospect, May of 2015 was either the wettest or second wettest on record, I’m not sure how it ended. My early season hiking was postponed as I spent time at home writing on this blog or cleaning the house or reading or working extra shifts or working out at the gym or whatever else I could think of to do to avoid the wetness. Finally, in desperation, I decided to cross the Continental Divide and head out to the relatively dry eastern slope of the Rockies. Here I had hoped to find sunny skies and dry conditions to alleviate the glum mood brought on by lack of outdoor activities. Of course, I could have hiked or even skied in the Gunnison River basin, but I was ready for an adventure outside of the realm I live in and chose one of my recent favorite areas to explore. Taking U.S. 50 east over the summit of Monarch Pass, where the snow was still piled high enough to ski, I drove down to Salida and had a breakfast at Season’s Cafe where I had my appetite sated by a fine meal made locally. I then drove down U.S. 50 to the east into the Arkansas Canyon, now renamed Bighorn Sheep Canyon, to Texas Creek at the junction with Colorado State Highway 69. There I crossed a small county-maintained bridge over the Arkansas River and to the parking area established by the Bureau of Land Management. The BLM maintains millions of acres of public lands throughout the western United States, but most people do not know much about this agency that is responsible for so much of the public domain. The National Parks and Forests tend to get more attention, but these BLM lands can be full of wildness and wonder for the intrepid soul willing to explore the backwaters of the lands that belong to us all. Once parked I began to hike and explore the confusedly named Texas Creek Gulch. I suppose this name references that this is the gulch that is directly across the Arkansas River, on the north bank, from Texas Creek on the south bank. This area is heavily motorized and is not the place to go if you wish solitude while hiking on established routes. Nonetheless, the southern exposure warms up quickly and I was seeking warmth. And the beauty found here is exquisite, full of granitic outcroppings and numerous species of early season flowering plants. The first thing I did was take Trail 6025, a dead end route that terminates at a high point of granite and shrubby growth. This country is steep and challenging, as even the minor drainages can produce deep gullies. Along the way I stopped to admire the cactus in bloom, a rarity that can be seen only with fortunate timing. 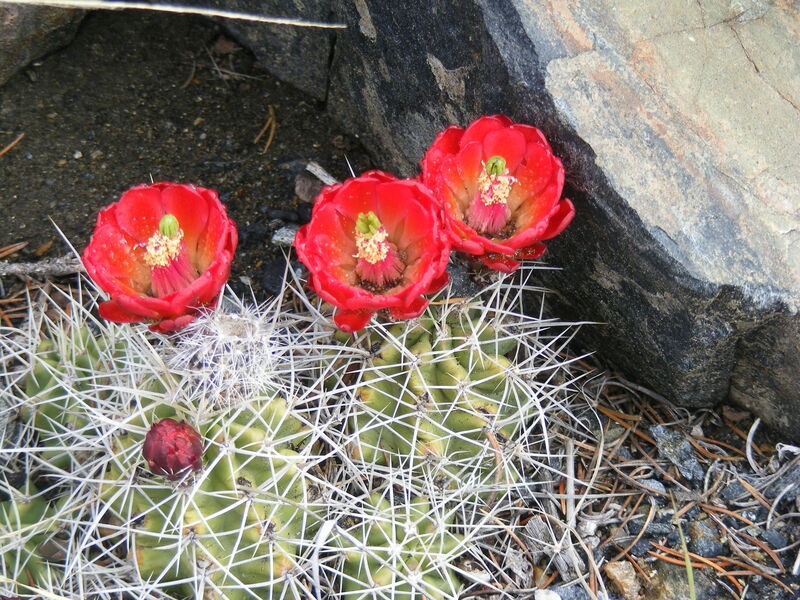 The blooms were a deep, spectacular red and I believe that I was witnessing the cactus that is called a Claret Cup for obvious reasons. The view from the summit made me feel that I was bobbing about on a sea of granite. The McIntyre Hills south of the Arkansas and the surrounding pediment are either granite or metamorphic rocks and each succeeding ridge was like a crest of a wave, only these are still and motionless, erosion moving so slowly as to be generally not perceivable. The path of the Arkansas River as it carves its way through the resistant rock could be followed for only a short distance before being swallowed by the endless rocky breakers. The day was just as cloudy as it would have been in Gunnison, but at least it kept me cool and there wasn’t any real precipitation to add to my woes. The only real unfortunate situation brought about by the clouds was that it made photography difficult when trying to document the landscape. The contrasts are difficult to avoid, but the opportunity to take snapshots of the flowers was markedly better than normal. I walked back down to Texas Creek Gulch and then walked upstream, being only occasionally hazed by the motorized recreationalists who were out thrill seeking in their own manner. Technically, I believe that this road is a county road, so I have no real basis for complaint, but I do like my quiet. Eventually, I headed up Trail 6036 west of Texas Creek Gulch and crossed a low ridge and into Reese Gulch. There are many small nooks of rock to find solitude if I want, but as this trail is a bit more challenging for motorized users it is empty and I leave the crowded gulch behind. The recent snow and rain have created the unusual presence of flowing water where normally it is not found. That makes the hike that much more pleasant for the German shepherd dogs, Draco and Leah, who like to be able to lap up water whenever the mood strikes them. If they go a mile without water it becomes a crisis, I say with a hint of sarcasm. At Reese Gulch, Trail 6036 ends at Trail 6035 which runs either north or south. I head north to follow it on its loop up out of Reese Gulch and into numerous small drainages of Fernleaf Gulch. Water is still scarce, but the occasional sounds of water splashing as it cascades over a ledge and lands on rocks below can be heard here and there. The shepherd hear it, too, and we all find hidden groves of chokecherry and thimbleberry away from the main trail. This day has been a blessing, what with the cool weather and live water. We descend from the divide between the headwaters of Reese Gulch and head to the much large Fernleaf Gulch where the water flowing from the northern highlands has created a small river. We get down to this large creek and the sounds of large rocks being tumbled about by the rushing current are audible over the sound of the pulsing water. Erosion is generally slow, but here I can see the channel being created, destroyed and recreated right before my own eyes. Relatively low, elevations ranging from six to seven thousand feet above sea level, and warm, the cottonwood already have their leaves and the fresh, bright green contrasts with the darker green of the conifers and the red rock. Because motorized vehicles are not allowed down to the gulch itself, I have some privacy and it is devoid of other humans. A fine place for lunch and a break from my relentless hiking. Eventually, the shepherds and I continue on our counter-clockwise trek around the loop that Trail 6035 makes and we return to the junction with Trail 6036. Instead of retracing our steps back the way we came, we continue down Trail 6035 and Reese Gulch. Here is where having well trained dogs has paid off. We hike along, minding our own business, when suddenly on a small bluff not more than a hundred feet away a coyote begins to bark and howl at us. I worry that the dogs will try to chase this beast, but they heed my commands and continue to follow me down the trail. I can only surmise that this coyote may have had a den nearby and was protecting her brood, but of course that is only a guess. Regardless, out of respect for Canis latrans, I quickly move out of the area to let the critter have some privacy and the ability to continue on with life as The Creator has ordained. The remainder of the hike passes by with nothing but spectacular scenery, whether it is the flowering plants or unusually eroded granite. We descend Reese Gulch and Trail 6035 until we reach Trail 6026 and we hike back east towards the trailhead. It is busier here, with many motorized machines whizzing by rapidly on the road below that parallels the trail I am on, but this single track is quiet and I enjoy the views that I have of the Arkansas River below. Eventually we reach Texas Creek Gulch and walk down to where that drainage confluences with the Arkansas River and the dogs happily dunk themselves in the water. I am a bit concerned because the Arkansas is flowing high, but the canines have enough sense to not go far out and I am relieved when they return to shore. This has been a fine hike, full of beauty and color despite the overcast day. We climb into the car and, blissfully ignorant of the disruption that our passing causes, whiz back westbound on U.S. 50 towards Gunnison. At Monarch Pass we stop and the dogs get out and climb on the snow banks, reminding me that Winter still rules here no matter what the calendar says. Oh, Happy Day! To go from the mountains to the lowlands in our modern conveyance barely cognizant of the environmental and social damage that our adventure creates. This world can seem so confusing at times; we each have to make our own choices and then live with them. I love to travel and see new things and old, but I don’t care for the disruptive harm cause by our rapid and motorized society. In the end, there isn’t much I can do but to enjoy the beauty that I come across and hopefully create some beauty of my own. Mid-May and the weather is variable. Today is cloudy and overcast, a solid layer of gray from one horizon to the other. There is a decent chance of precipitation, but more on my mind is the threat from lightening. As much as I enjoy exploring the various nooks found throughout the wild backcountry of the regional public lands I would rather not be struck by a bolt and have my life prematurely terminated by the Creator. The clouds seem benign, not filled with the turbulence that brings about the electrical storms that I dread when hiking. So, I decide to finish, for the time being, my explorations of Dillon Mesa. Once again I park the car at the trailhead used to access the Dillon Pinnacles, magnificent spires, fins and hoodoos eroded from the West Elk breccia. Photography is difficult in the low light, producing contrasts that don’t translate to imagery well. I begin my hike along the trail just above the waterline attained by Blue Mesa Reservoir. The sagebrush sea comes to an abrupt end here and during low water there are beaches full of cobbles and nascent groves of willow and cottonwood. I am going to walk up Dillon Gulch again, and soon I pass the ponderosa pine with a bench under its outstretched limbs where I pause and enjoy the setting before moving on. This hike will be a challenge to find a route from the mesa top down to West Elk Creek, but nonetheless I am in no hurry and stop here and there to photograph some of the wildflowers that I have previously neglected to document. Getting to the top of the mesa would be a relatively quick stroll as I am already familiar with the various landmarks, but I take a shortcut up to the western lobe of Dillon Mesa so that I can walk down to a point just above the pinnacles. It is different to look down on the spires and fins and I sit and gaze about, wondering if anybody sees me from the official pullout on U.S. 50 before I move north to find the point from which I wish to depart the mesa top. I earn fine vistas of the West Elk Mountains to the north, the Sawatch Range to the east and the San Juan Mountains to the south. My western view is of the various ridges that separate West Elk and Soap Creeks and of Black Mesa. The views to the east and south go on for dozens of miles and the Continental Divide is visible from near Silverton to just south of Leadville. I find the point that I had scouted out a few days before. This break in the mesa’s rim seems as if it will allow a hike down a relatively gentle slope. By gentle, I mean steep but not impossible. I stop and gaze about, uncertain about the next step, but decide that it is the right time to take the plunge and begin to walk down through the Douglas firs. Fortunately, the forest is somewhat open and downed snags are easily avoided and after descending some hundreds of feet I reach the sagebrush sea. I see where I want to be, and am even more fortunate in that there are plenty of game trails leading to where I want to go. Crossing the numerous gullies is still a challenge and my goal of reaching West Elk Creek seems so far away, but I know that the distances can be deceiving to perception and my map suggests that only a meager half a mile spans my location and my goal. I plod on, and with each rise the creek is closer. In this relatively low elevation much of the vegetation has already gone green and studying the flora is a gratifying edification of the mind. I realize that I am now on a fairly consistent trail that is leading right to my goal, and suddenly I am there. I climb down one, last slope and am walking along the creek. It is wild back here, but access is made somewhat easy by the waters of the reservoir and the National Park Service has established a boat camp here. It is not in use at the moment, but there are a couple of fishermen who have boated in to fish the lonely waters of West Elk Creek and they are startled to see a hiker show up. Before the Gunnison River was inundated by the dam, there was a road or two that had been bladed in and were subsequently abandoned when the access was covered by the depths of the still water. This abandoned road continues for some miles upstream, but I only trek on another half a mile or so. I plan to return via a saddle just west of Dillon Pinnacles, but am not entirely sure that it can be reasonably done. There is a chance that I will have to backtrack a distance that might add three or four miles to my hike, so I decide that I have gone far enough for the day and revel in the wildness of the waters that are pouring out of the rugged mountains to the north. This canyon that West Elk Creek drains is a steep V, deeply carved out of the breccia that so spectacularly forms the pinnacles nearby. It is wild country. I find the return hike to be easier than anticipated as the game trails that had earlier assisted my trekking now again make the passing fairly straightforward. The most difficult part is ascending the small pass that forms a gate to the west end of the pinnacles. The rock is crumbly and steep, but the wild things that come and go over this route have made a fairly stable base along which I can carefully walk. Draco and Leah, my two German shepherds, have no trouble at all with this section as their four paws allow for greater traction and stability. In this geologically strange setting I find flora that I have not seen before and figure it must be somewhat rare. I am happy to revel in the diversity of life that exists right here in the Gunnison Country. My path may be treacherous but it is rewarding to be reminded of the sanctity of life and with renewed enthusiasm I make the final climb to the pass where the dogs greet me with wagging tails and general frenzied behavior. Here at this summit, I am standing directly under the pinnacles and they are even more amazing that when seen from a distance. I can see the poorly sorted, angular rock within its fine matrix that typically defines breccia. My perspective is so much different here, close up. It is obvious that rocks come tumbling down from above with regularity as they are scattered about the sagebrush and Douglas fir. This land is mobile and alive, and each storm reshapes the pinnacles, loosening some rocks and exposing others. After another hike along another game trail, a seemingly short half a mile up and down through steeply eroded gullies, I reach the trail maintained by the Park Service. I look back at where I was standing a half and hour ago and marvel at the diversity of life and geology that I have witnessed today. Now I am on familiar ground and the remaining two miles of this hike will go by quickly. The weather has been pleasant all day, cloudy with no rain, perfect for hiking. I was only a little scared by the threat of lightening. Now that I am on a trail, easy to walk on and easy to follow, I slow my pace and take time to gape at the pinnacles and the ponderosa pine that grow on this dry south face. Typical sagebrush sea, there is rabbit brush, lupine, phlox, mountain mahogany, currants, sunflowers and so much more growing. The dull gray-green is spangled with small blobs of color that spans the hues of any rainbow. Orange paintbrush. Yellow sunflowers. Blue Lupine. White, representing all colors, phlox. As I stroll past the last section of pinnacles, I being to drop down towards the reservoir. The dogs are happy to get into the water and they splash around with glee and abandon. Even though I have seen it all before, I can’t stop looking at the familiar and beautiful flowers growing along the trail. I don’t neglect the smallest plants nor ignore those that aren’t in bloom. All species of life are sacred and worth taking at least a moment to contemplate. Every time I walk outdoors it is something of a religious experience and I can do nothing but ponder the mystery of it all. May had been showing typical Spring weather here in the southern Rocky Mountains of Colorado. One day, it might snow… or rain or sleet, and then the next it might be sunny without a trace of clouds in the sky. Today seemed like a great day to revisit Dillon Mesa with nary a cloud on the horizon. A few days previous I had attempted to walk atop the mesa only to get scared off by the prevalent thunderclouds that had been building up. The mesas are exposed to the elements and are not the places to be when lightening starts touching ground. To be certain that I would avoid any lightening strikes I left early in the morning and drove out to the Dillon Pinnacles Trailhead where I parked the car and began hiking along the trail of the same name. About a mile out on the trail, having walked through the mighty sagebrush sea blazing with colorful wildflowers, I took the unmarked right hand fork that leads up Dillon Gulch. This trail shows up on some maps as an old road, although on the ground there isn’t much trace left. Regardless, I am happy that the road has been closed and that the only access is by foot or hoof. 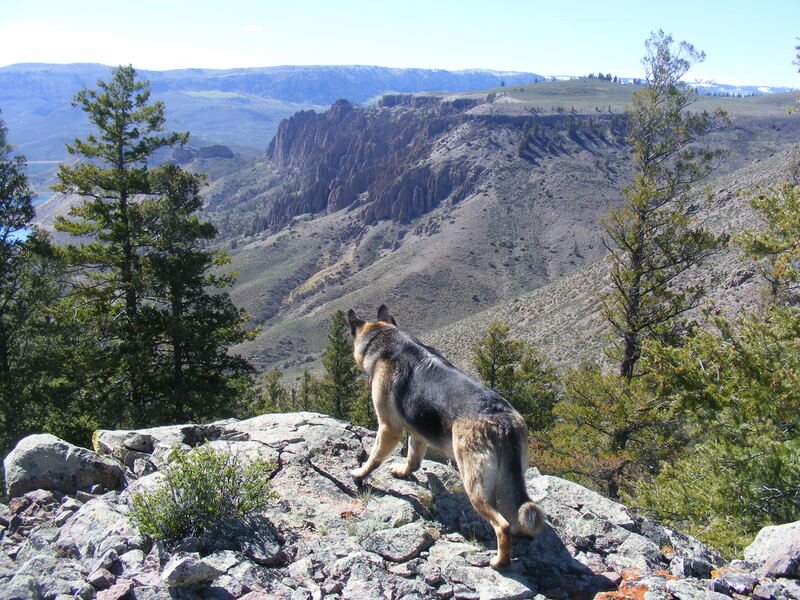 As we, Draco and Leah, my two faithful German shepherds, and I, climbed the gulch, the vegetation changed along with the elevation. My senses were enlightened by the distant views of the San Juan Mountains to the south while the shepherds were more interested in the bunnies and squirrels. As we approached the headwaters the gulch flattens out and the steep walls of the lower portion give way to the wider meadows studded with groves of aspen and conifer. Soon, we crested the rim and were standing on a large flat, a thousand plus feet above the stilled waters below, and my views extended out nearly a hundred miles. In small patches where shade provided shelter from the sun stood small patches of snow from the previous week’s stormy weather. The West Elk Mountains to my south were shrouded in a new white cover, as if all the effort of melting the winter’s snow were in vain, and the San Juan Mountains looked whiter than ever. Cannibal Mesa and the other high points of the Powderhorn Wilderness were also covered in new snow, and my thoughts were that Spring has a funny way of looking much like winter. Dillon Mesa is a large flat plateau formed from a massive lava flow dating to the Tertiary. It runs more or less on a north to south axis, having originally flowed from the West Elk Mountains south to were the basalt met with the same type of volcanic rock flowing north from the San Juan Mountains. Yes, as benign as Colorado is today, some tens of millions of years ago it was a maelstrom of volcanic activity. Today, the southern portion of the mesa is bisected by Dillon Gulch and there are two lobes, one each on the eastern and western flanks of the gulch. From the end of the gulch I walked about a half a mile north and found an overlook of the western lobe where I could look down into the rough country that West Elk Creek flows through. However, I was interested in hiking down the eastern lobe, so, after a rest and study of the topography of West Elk Creek, that is were I moseyed off to. Here on the mesa top the plateau is home mostly to Douglas firs, but there are a few large, old ponderosa pines that stand out from the conifer crowd. Ponderosa happen to be, for some reason, my favorite tree and I take note of their presence wherever I am. Its not that I favor them over all other forms of life, its just that they appeal to my sense of aesthetics with their long needles, yellow-orange bark, butterscotch odor and general stately nature. I wandered from grove to grove, searching out the one or two ponderosa that grew among the Douglas fir, noticing that the snow was steadily decreasing in volume. It was just good luck that the sagebrush was interspersed with enough grass to keep this wandering soul from sinking up to his ankles in mud. There were some patches of muddy soil that were avoided with a bit of effort, but overall the hiking was fairly easy. Emerging from some trees, I saw a group of tawny colored masses that proved to be a small herd of cow elk grazing the sagebrush sea. Not wanting to cause them undue alarm as they were recovering from the winter’s starving season and were also due to give birth to their calves soon I changed my tack farther to the east than I had intended and passed through some aspen where I hoped that the shepherds and I would remain out of sight and smell. This is the part were I am blessed with two well mannered and trained dogs. Dogs can cause elk all sorts of grief and stress, and I was happy that Draco and Leah kept to my heel with but scant urging on my part. What little sound I had to emit after the initial command was faint clicks of encouragement. My eastern tack led me to overlooks of Red Creek, percolating through the rocks below the east edge of Dillon Mesa. I could see the Great Divide rising above all far to the east, snowy and white and demonstrating one of the older names for the Rocky Mountains, that is, the Shining Mountains. Flowers were growing here on the mesa and Draco, Leah and I continued walking to the south and land’s end. Eventually we reached the southern point of Dillon Mesa and stood atop the rocky escarpment so easily espied from below. The dogs continued their fascination with the small mammalian life forms found here while I reveled in the views up and down the old channel of the now impounded Gunnison River. Naturally enough, I whipped out my map and studied the topography of the surrounding world. In my mind’s eye, I could visit many of the places I saw from this high point and my imagination soared like an eagle riding the currents. Finding a path down from this high point is something of a challenge, as the vast majority of the mesa top is rimmed by a fifty foot cliff of igneous rock. I could backtrack my way miles to the north, but I remembered that in my previous visit here I had found a path down an isolated gulch where the rock rim was only ten feet tall. This break in the escarpment was gentle enough to allow the dogs and I safe passage and with a bit of astute navigation I was able to wander down from the mesa top and rejoin the Dillon Pinnacles Trail near the point where it leaves the reservoir shore and begins to meander up Dillon Gulch. Getting from the top to bottom led me through a forest of handsome Douglas fir and past patches of Gambel’s oak. The most difficult part was where the soil had been eroded or never had formed and the rock was bare and crumbly. I had to make short detours here and there, but generally following the trails that deer and elk have created led me through the more challenging sections of topography. Upon rejoining the trail, I was able to make an easy stroll back to the trailhead after leading the dogs to the shore of the reservoir so that they could relieve their thirst. Overall, this hike was a fine exploration of the local geology, topography, flora and fauna. My soul had been lifted to the heights above along with my physical body and when I walked up to the car I gave a brief prayer of thanks before driving home. All in all, this short excursion into the backcountry above Curecanti National Recreation Area was well worth the effort to see Spring’s rebirth and the continuation of the abundant life found here. Spring in the Gunnison Country is something of a tease. First, in March, the weather warms up and the deep freezes are left behind. Thus, the conclusion is that soon enough the snow will melt and the grass will green up. Then, second, the winds kick up in April and with the winds are usually dark, moisture laden clouds that drop their burden of snow on the community. Third, May rolls in and with it are warmer temperatures but not enough to prevent snow from flying in the high country. Not only that, but generally most of the wild vegetation doesn’t green up until later in the month, and the landscape seems locked in a permanent gray of worn Winter. Therefore, on this cool, windy day, I drove out east of the City of Gunnison to Cabin Creek where the relatively low elevation would keep me warm and dry. The snow level seemed to drop down to about nine thousand feet, but the creek bottom is closer to eight thousand and remained snow free during the night’s storm. 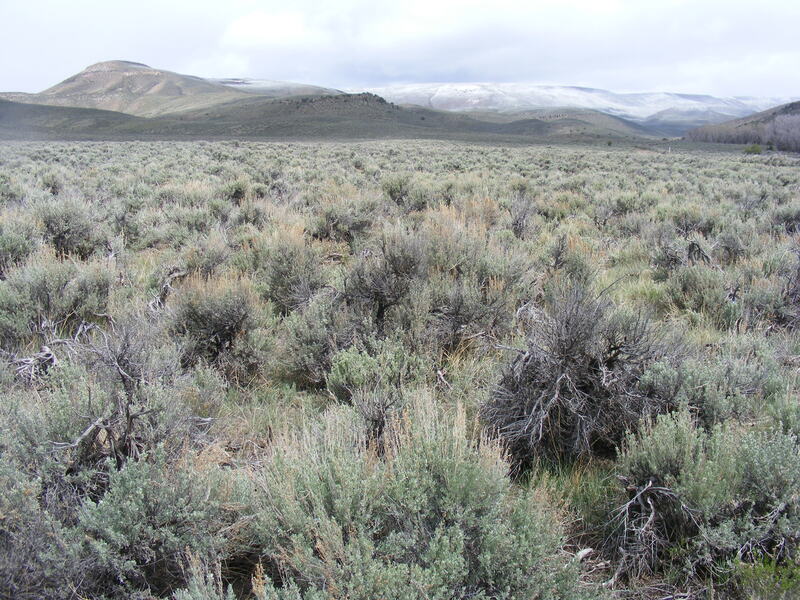 Lower Cabin Creek is one, large swath of sagebrush that tops all the nearby ridges and high points. There are cottonwood and willow near the live water, but otherwise this landscape is generally sere. Spring is a fine time to get out and explore the sagebrush, as long as the grouse aren’t disturbed during their mating rituals and for this reason I begin hiking after nine in the morning. 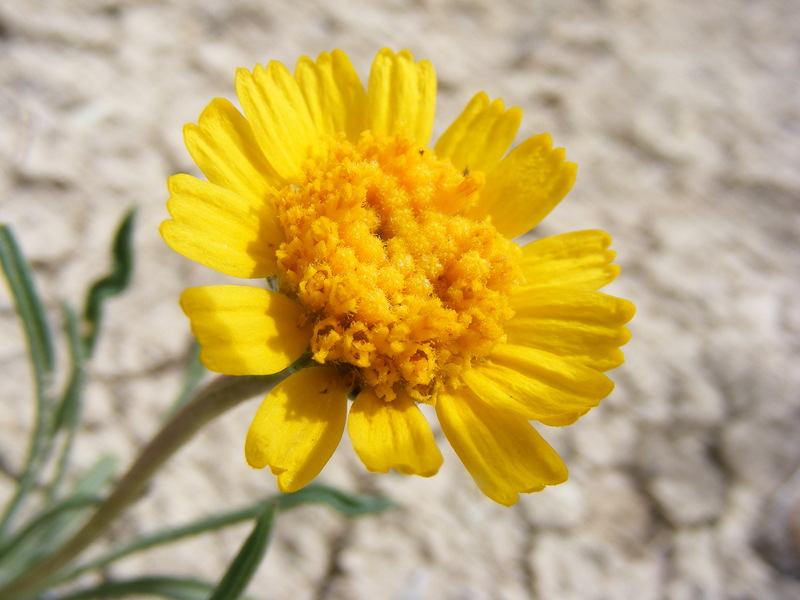 Despite the snow, the climate is now warm enough for many of the early season plants to pop up and bloom and the sagebrush sea is studded with a variety of colors and species of forbs and herbs. We, the shepherds and I, stroll along the road that is still closed to vehicular traffic. The road is closed so that the grouse and elk aren’t disturbed during the critical Spring season but also so people don’t tear up the road during the melt-off. In the first half mile or so there is a small outcropping of sandstone and I am reminded that this area used to be underwater so many millions of years ago. Its hard to believe but the evidence is stark and conclusive. The grass is fairly green in the creek bottom but the willow and cottonwood have yet to bud out their leaves. The wild roses are the same and the landscape is a mix of fresh green and dull grays, the latter being from the remnants of the previous winter. Nonetheless, Spring has been brewing and this fresh snow that is gracing the high ridges will not last the day. Soon enough this area will erupt with verdure and shining times will be upon us, when life is easy and the warm weather breeds indolence. Our hike is short today, really just a reason to get out of the house and let Draco and Leah stretch their legs and occupy their dog-minds with thoughts of rabbits and rodents. We walk about three miles up the road. The road is mostly level, well, at least as level as a road is going to be here in this mountainous country. Under a grove of cottonwood we take shelter as a squall descends upon us and brings with it snow and sleet. There is a huge mess here left over from the previous year’s campers and I pick up nearly two dozen aluminum cans. There is nothing wrong at all with getting out an camping, and I don’t mind when people want to target shoot but the amount of trash left at this sight is discouraging. 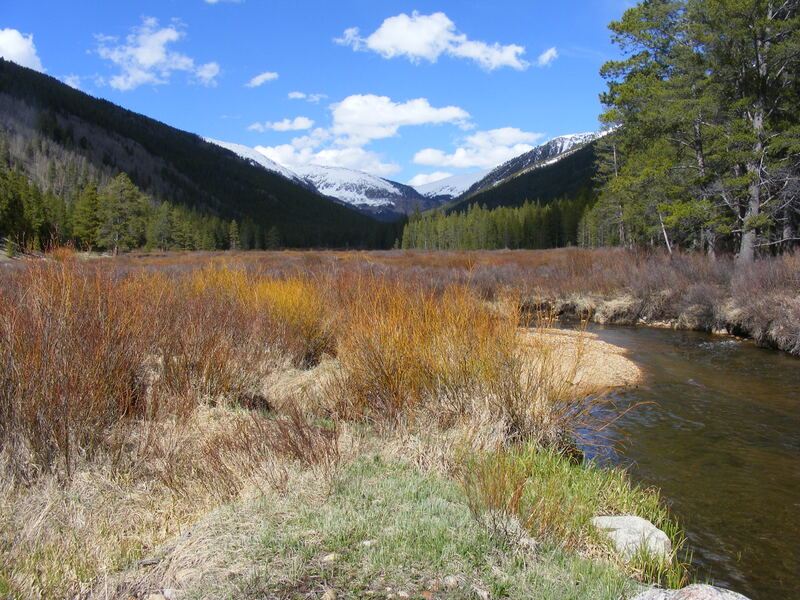 These public lands, in this case Cabin Creek and environs are managed by the Gunnison Office of the Bureau of Land Management, belong to us all and, in my opinion, only the truly lazy and thoughtless would trash them out so badly. Well, I suppose it is part of my civic duty to pick up other people’s trash, but I would be lying to say it doesn’t rile me. The setting is pleasant, and after picking up the cans I feel better, that I have set a good example for those who follow. I find that the vast majority of folks regardless of political perspective appreciate getting out into the woods and generally cherish the clean settings to be found here. I ponder the situation I have found here and can only conclude that some folks are just overwhelmed with life and have to leave their mess for posterity. Shame on them, but I realize that they have their own troubles. The squall isn’t that strong and Draco, Leah and I begin to walk back to U.S. 50 where the car is parked. Typical Spring, the clouds pass and the sun comes out and now, after I have donned warmer winter clothing, I am hot. The sunlight illuminates the green grass and causes the water droplets to sparkle and shine. There is much for me to do back in Gunnison and I regret that this hike is so short. Regardless, I give thanks for having the time to make this brief excursion. The fresh moisture brings out the odor from the fragrant sagebrush and this smell awakens my senses to the land around me. I am filled with mirth after this walk and smile to myself as we stroll past the sandstone outcropping, reveling in the glory that is the Rocky Mountains.